Replication in Experimental Economics' highlights the importance of replicating previous economic experiments for understanding the robustness and generalizability of behavior. Replication enables experimental findings to be subjected to rigorous scrutiny. Despite this obvious advantage, direct replication remains relatively scant in economics. One possible explanation for this situation is that publication outlets favor novel work over tests of robustness. 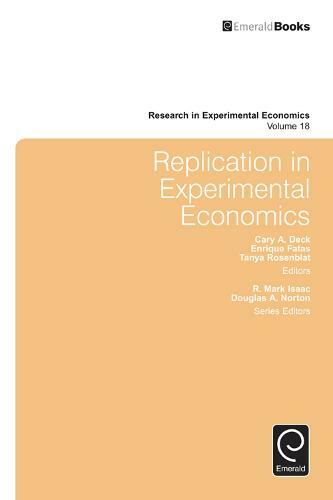 This volume of Research in Experimental Economics raises awareness of the need for replication by being the first collection of papers specifically dedicated to the replication of previously published work. The chapters, by leading researchers in the field, explore the robustness of topics from the effects of subsidizing charitable giving to people's ability to backwards induct and from the impact of social history on trust to the role of isolation on valuation. Readers will gain a better understanding of the role that replication plays in scientific discovery as well as valuable insights into the robustness of previously reported findings.